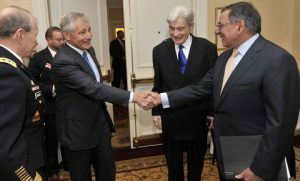 Chuck Hagel, a Nebraska Republican who served two terms in the Senate, is reportedly being considered as a potential successor to either Defense Secretary Leon Panetta or Secretary of State Hillary Clinton. Foreign Policy first broke the story Wednesday, reporting Hagel is being vetted for a top national security post in the Obama administration. Josh Rogin writes the Obama transition team offered Hagel the homeland security secretary, director of national intelligence and ambassador to China posts in 2008 and he turned all of the offers down. National Journal is reporting the names of Sen. John Kerry (D-Mass.) and United Nations Ambassador Susan Rice have also been floated for both the secretary of state positions. Rice is meeting this week with Republican lawmakers on Capitol Hill that have indicated their opposition to her becoming secretary of state. If she is not chosen for that position, Foreign Policy reports she could be named national security adviser in the White House, with current adviser Tom Donilon potentially being promoted to chief of staff.